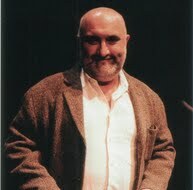 Alexei Sayle was born in Liverpool on the day egg rationing came to an end. He always knew his parents were different. They ate salad. And they only read the Soviet Weekly. They also travelled to seaside towns to attend union conferences and they travelled across Europe. Determined to see Communism in action, they went to Czechoslavkia, where they visited the sites of massacres, rode in space age limousines and sat in the audience of bizarre mime shows. Alexei Sayle performs excerpts from his new book Stalin Ate My Homework an hilarious memoir of his confusing life as the son of Communist parents, his childhood in Eastern Europe and his years as a teenage Maoist. Stalin Ate My Homework is a funny and perceptive portrait of a family, a city, a country and a continent going through enormous changes. Alexei will also answer audience questions on his dazzling show business career and easy stubborn stain removal.